It is auto-scroll to source on mouse click. 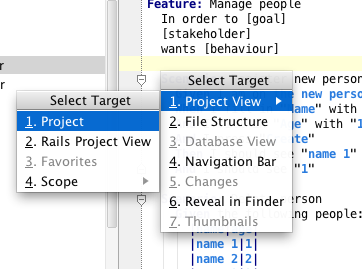 "[Main Menu] | View | Select in... (Alt+F1)" shortcuts to select current file/class method in project view/finder/etc. Thank you very much Roman ! Very helpful. 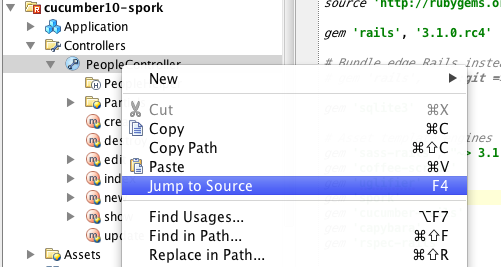 in RubyMine, or there is a way to to do it that I'm not aware of. Alt+F1 is a step towards that direction, yet an option that will do it for you automatically could be awesome :-). Is there anyway to set this up as a single keyboard shortcut? I tried using a macro allowing to do this as a single keystroke but the "select target" drop down that pops up as a result of "Select in..." doesn't seem to register in macros. This is an very old post but is quite good found in internet search, so I want to answer this if someone (like me) comes to this page.